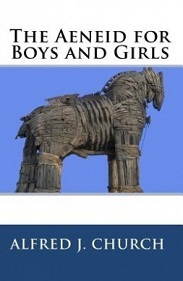 'The Aeneid for Boys and Girls' relates the compelling tale of Aeneas, the legendary ancestor of Romulus. Aeneas escaped from the burning city of Troy and wandered the Mediterranean for years before settling in Italy. Patterned after the 'Iliad' and the 'Odyssey', the 'Aeneid' was originally composed as an epic poem by Virgil to glorify the imperial city of Rome.